We have heard it all before… “You only have one chance to make a first impression.” Here at The Write Impression, we fully believe in that simple truth. That’s why you will always be greeted with a smile from one of our amazing “Impressioneers” when you walk into our store, because we want you to feel like you’re coming home! And beyond that, we want to help YOU make the best first impression on the people you meet as you journey through life, which is the entire reason why we decided to start this blog. Making the Write Impression is where you will find all sorts of tips to impress on a variety of topics — writing thoughtful letters, selecting the perfect gift, decorating for parties, and learning the proper etiquette for weddings and other social situations, just to name a few. There is something warm and fuzzy about shopping at a familiar store in your community. 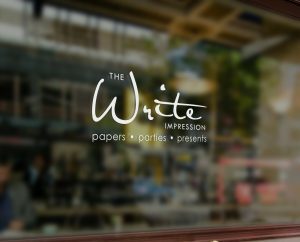 Locally-owned and operated by Murfreesboro native Susan Grear, The Write Impression has grown to feel like an old friend to so many in Rutherford County. Whether you are one of our most loyal (we would NEVER say oldest!) customers or a new patron of our store, we want to answer those frequently asked questions for you! Is there a benefit to ordering paper products from The Write Impression as opposed to an online vendor? Absolutely, positively! At The Write Impression we live by our mission, “to provide our community with quality merchandise and service in a hometown atmosphere, at a fair and reasonable price.” Our team is committed to making your experience personal so that you walk away with exactly what you envision. In a pinch? 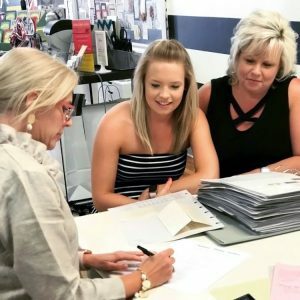 In most cases we can provide 24-hour turn around for your invitation when you select from our large selection of in-store stock.We are here to carefully guide you through every step to ensure a product that is professional and certain to make THE WRITE IMPRESSION. I need to purchase personal stationery, but I don’t know what I want to order. How will you help me? The Write Impression offers hundreds of styles of folded and flat note card styles. From embossed to engraved to completely custom with on demand printing — in a range of price categories!! We love helping our customers select the perfect stationery reflective of your personality. Do you only sell stationery and invitations? This is one of our favorite questions! Many customers visit us in search of the perfect social or party invitation, birth announcement, personal stationery, or wedding invitation and say, “I didn’t know you had that in the store!” The Write Impression carries a unique selection of gift items for every occasion imaginable including jewelry, women’s apparel, handbags and clutches, plates, napkins, baby gifts, and Murfreesboro merchandise! Even gifts for him! Whether you are shopping for a baby, bride, friend, hostess, significant other, or yourself, we know that finding the perfect treasure will make the gift of giving a more meaningful experience. 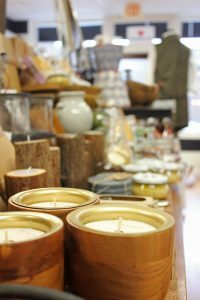 Lines include Capri Blue candles, Casafina and Costa Nova Italian pottery, Caspari paper products, CatStudio, Elizabeth Bray jewelry, Haley and Hound clothing, Illume candles, Mud Pie, ReWind candles, Rifle Paper Company, Smathers and Branson, Southern Sisters, Susan Shaw jewelry, and many more! Does your paper ever go on sale? Certainly! Follow us on Instagram and Facebook to stay up to date with our latest product sales from our friends at PrintsWell and Embossed Graphics . Where are you located and when are you open? 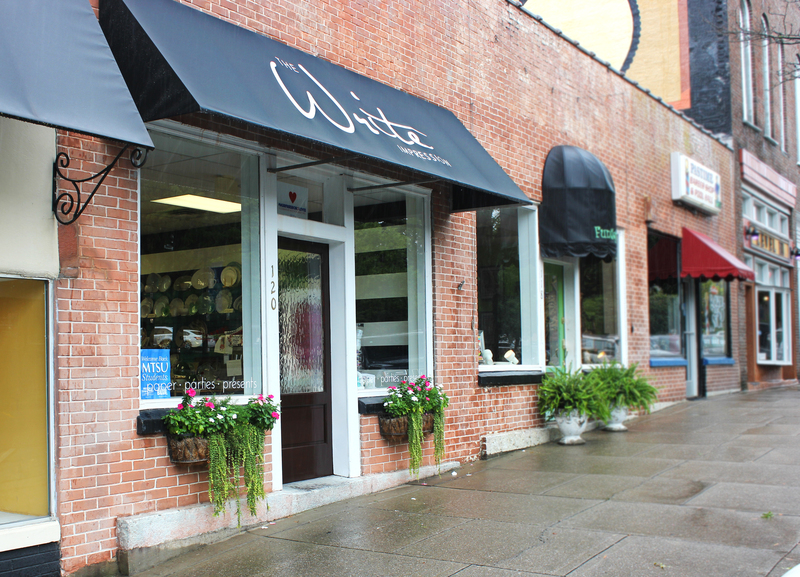 The Write Impression is a proud member of the Downtown Murfreesboro Business Association. Monday – Friday…. 10:30a.m. – 5:00p.m. Can’t make it in to the store? Shop in your pj’s on our websites! Do you have a question that we didn’t answer? Leave us a comment below! And make sure to subscribe to get email updates from our blog by clicking the green Follow button on the top right of this page!